Cast Plaques are available in both stock and custom sizes. 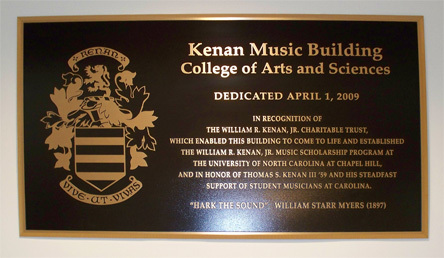 The Kenan Music Building (Left) cast bronze plaque 41" x 20" includes the Kenan family crest and inscription. We also created an engraved replica (Below) of the larger plaque that was presented to the charitable trust during the dedication ceremony. 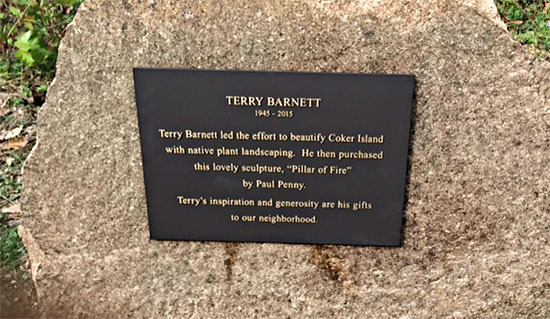 (Left) Bronze Plaque installed on a rock. 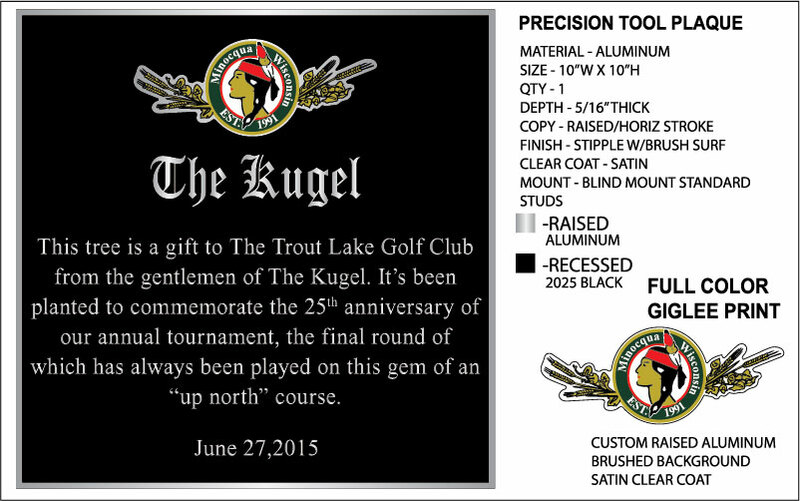 Above is a sample cast aluminum plaque with full color Giglee print. 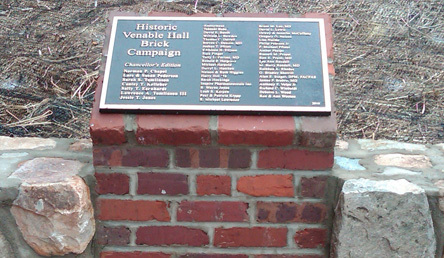 (Left) Historic Venable Hall Brick Campaign, Bronze Plaque, 24" by 15", is located on the campus for the University of North Carolina at Chapel Hill. Cast plaques can also include a high relief bust. + Cast letters have a minimum letter height of a half inch. 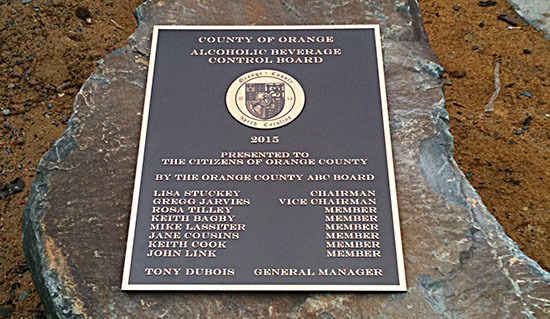 Above is a sample cast bronze plaque with photo graphics on flat raised panels. These panels can be custom cut shapes like the building or standard ovals and rectangles.It is also possible to have a 3 dimensional bust created by an artist working fom a photograph for a high relief alternative. Above is a sample of a High Relief Bust in Bronze, a 3D artist works from a photograph to create the bust in plaster which can be viewed prior to casting in bronze. This allows you to preview what the bust is going to look like ahead of time and requests changes to the bust. Including a bust on a cast plaque does increase the turn around time, depending on how backed up the 3D artist is it can take as much as 6 to 8 weeks after the approval is given for production. Above is an example of a cast aluminum plaque that was created to be mounted to a bench. This is a great outdoor solution that will last for years and decades to come. This example also uses a spot color of the Carolina Blue to enhance the plaque with the school logo and color. Custom Cast Aluminum with Spot Color. Economy Cast Aluminum Plaque Options with raised border and room for Laser Engraved Aluminum or Plastic Plate with custom inscription. Great for Garden Dedication, Pet Memorials, Tree Dedication, Botanical Gardens, Cemetery Markers. Ranging in size from 4" x 6" to 8" x 10" as well as 3" x 9" (see below) especially for bench plates (CAP39FB-BK) holds a 2"x8" Engraved Plate.